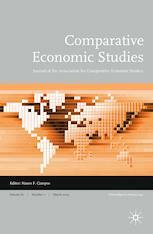 Comparative Economic Studies is a journal of the Association for Comparative Economic Studies (ACES). It aims to publish papers that address several objectives: that provide original political economy analysis from a comparative perspective, that are an accessible source for state-of-the-art comparative economics thinking, that encourage cross-fertilization of ideas, that debate directions for future research in comparative economics, and that can provide materials and insights that are relevant for teaching, public policy debate and the media. Comparative Economic Studies welcomes both submissions that are explicitly comparative and case studies of single countries or regions. The journal is interested in papers that investigate how economic systems respond to economic transitions, crises and to structural change, brought about by globalization, demographics, institutions, technology, politics, and the environment. While maintaining its position as an important outlet for work on Central Europe and the Former Soviet Union, the scope of Comparative Economic Studies encompasses other areas as well (European Union, Asia, Latin America, and Africa). Is Privatization Working in Ukraine?